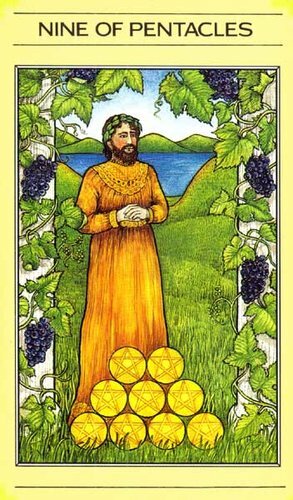 Weekend Reading: Nine of Pentacles from the Mythic Tarot. This weekend do something to acknowledge all your hard work. Whether personally, professionally, domestically or some such way, you've accomplished a lot and grown. Sometimes we just keep forging ahead and forging ahead and forget to stop, take a breath and look back on how far we've come. So this is your cue. Take stock of yourself this weekend and do something to pat yourself on the back. Maybe it's something symbolic like planting a flower in your own honor. Or maybe you could celebrate with a nice dinner. Or a luxurious bath. Or a nice hike in the mountains. Whatever you do, though, make it something more than just thinking to yourself "yay me" as you forge forward. Commemorate your progress like the special event it is!